Included in the Elinor Ostrom Collection at Indiana University's Lilly Library was a recipe for a date crumb cake. It was in a file that contained, among other items, logs of summer writing retreats on Manitoulin Island and the itinerary for her 2007 trip to Uppsala University in Sweden to receive an honorary doctorate and to be the first recipient of the Linnaeus Medal. Following is a transcription of the page from the collection that included the date crumb cake recipe. Thought Goulters were coming & had no dessert so put together the following from misc. recipes. Elinor Ostrom's Date Crumb Cake was prepared by the Indiana Memorial Union's Sugar & Spice bakeshop and served to guests at the opening of the Ojibwe Public Art, Ostrom Private Lives exhibition at the Mathers Museum of World Cultures on January 31, 2014. 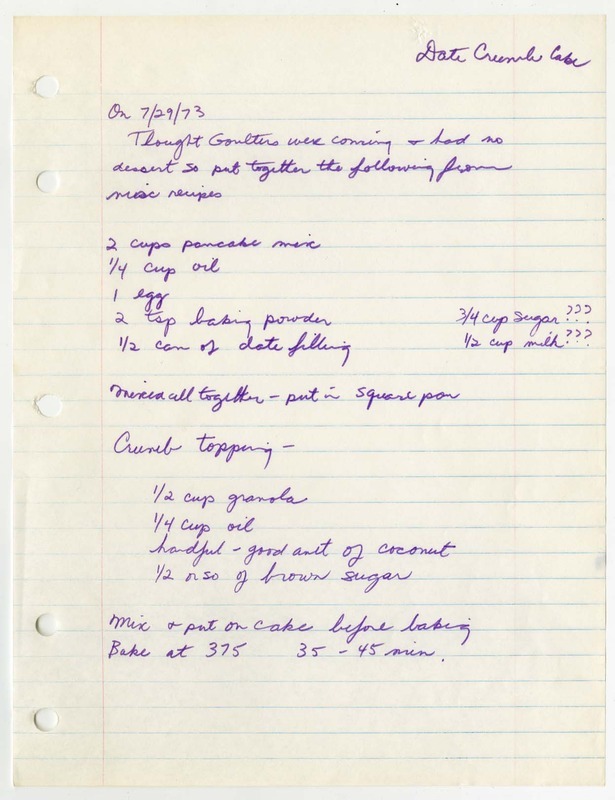 Date crumb cake recipe, Elinor Ostrom Collection, The Lilly Library.